Cat Got a Cold? Do NOT Reach for the Tylenol! One problem that frequently has cat owners calling or visiting their vet about is ‘kitty cold.’ Whether it’s a snotty nose, goopy eyes, or a case of the ‘sniffles’, kitty colds are common, and especially so in kittens and cats that have come from shelters. Many well-intentioned people have poisoned their own cat by trying to treat them with cold and flu medications they’d often safely take themselves. The most common culprit is Tylenol (active ingredient = acetaminophen). Whether the acetaminophen is on its own, or part of a combo cold & flu medication, even a small amount can have disastrous effects when given to a cat. Since cats lack the ability to safely process this medication the way we humans do, they wind up with severe liver and kidney damage, as well as red blood cells that are unable to carry out their normal (and vitally important) function of bringing oxygen to the tissues of the body. Read this article about how one woman inadvertently killed her cat with acetaminophen (which is referred to as paracetamol in the UK and many other countries). 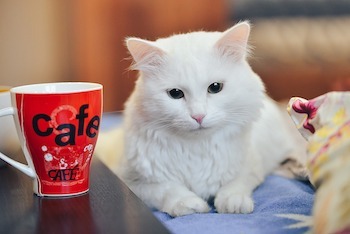 Though acetaminophen toxicity can be effectively treated if caught early and appropriate treatment is authorized promptly, many of these cats are sadly euthanized due to the worse prognosis that comes with delay or the associated costs of the intensive treatment and monitoring that is necessary. Please don’t ever medicate your cat for a ‘cold,’ or any other condition, without first speaking with your veterinarian. They are the best resource for you in such situations. In the case of a cold, you can take the safe and helpful nursing steps below to provide comfort and support for your cat while waiting to be seen by your veterinarian. Learn more about acetaminophen and cats, including a list of other products it’s commonly found in. Humidify the air they breathe: You can place a humidifier in the room they spend most of their time in, or place them in the steamy bathroom while you shower. This will help to ensure good hydration and function of their respiratory system. Increase their water intake: By adding canned food to their diet, and even adding a bit more water to their food, you can help to ensure they are well-hydrated. You can also flavor their drinking water with some chicken broth or the water from a can of tuna fish. Avoid the smoke: Though you should never smoke around your pets, this is one time where it’s even more important that you avoid doing so. Smoke, even second hand, is an irritant to the sensitive tissues of a cat’s breathing system.